There was something unusual on Broadway Street. Near a pile of snow, there was a sign that said "FREE SNOW — UHAUL." "You might want to add this one to your list of odd sights," The News commented. There had recently been an adoption in the Springwater area. "Bertha tells us that their son Albert and his family now have a 12-year-old orphan boy in their home," The News reported. "They had waited for about a year to get one. He will be a nice companion for their son, who has two sisters." A letter to the editor praised the newspaper for its coverage of alleged extraterrestrial sightings in the Barton area. "Yes we believe in UFOs and life in outer space. We believe they are just like us," wrote Boring resident Mrs. Allen W. Burt. "Years ago, when our college son was in grade school, he saw a vehicle and the man who flew it." Red Barn Preschool would soon host a bingo night fundraiser. Bingo cards were $1 each, and the "popular baked good table will be laden with goodies baked by the mothers of the school and will be sold along with coffee and pop throughout the evening. The event has proved to be an entertaining way for the school to raise funds necessary to its survival and also offers the community another opportunity to test Lady Luck," The News reported. Estacada Grade School staff and students submitted a letter to the editor thanking their school nurse Judy Beaudoin in honor of National Nurse's Week. "Her role goes beyond that of strictly medicine and care of an injury," the letter read. "She also has the uncanny ability to teach and counsel adults and children alike with varied medical concerns. We are lucky to have someone as dedicated as Judy Beaudoin." Adrian Perez was the newspaper's student of the week. Prezz, a junior at Estacada High School, had a GPA of 3.8 and hoped to become an aerospace engineer. He also enjoyed participating in soccer and track, and working on his 1967 Mustang. 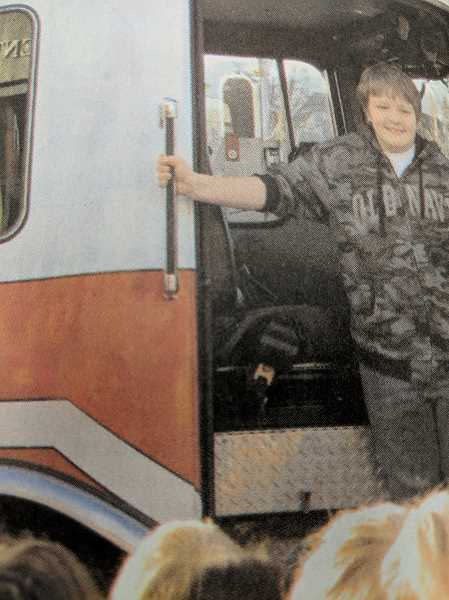 Clackamas River Elementary School student Trevor Cox enjoyed a ride to school in an Estacada fire engine. He won the ride after he chose the winning name for the fire district's dog Ember. The Estacada City Council and the Estacada School District were collaborating to develop approximately 20 acres of vacant district property and create access roads for the new Campanella Estates subdivision. Per the agreement, the site north of Estacada High School will eventually be developed into sports fields for use by students, youth leagues and community groups. North Broadway Street and Northeast Hill Way will be extended across school district property near the area in order to connect to Campanella Estates and to ease traffic on Northeast Sixth Avenue near Estacada High School.